Born in 1723, he received the finest education available to a bright young gentleman of that era. John attended the preparatory school in Haddington Scotland. He proceeded to Edinburgh where he attained a Master of Arts, then to four years of divinity school. At this point he was twenty. In 1743 he became a Presbyterian Minister at a parish in Beith, where he married, authored three noted works on theology. He was later awarded a Doctorate of Divinity from the University of St. Andrews, in recognition of his theological skills. It was only through a protracted effort on the part of several eminent Americans, including Richard Stockton and Benjamin Rush, that the colonies were able to acquire his service. 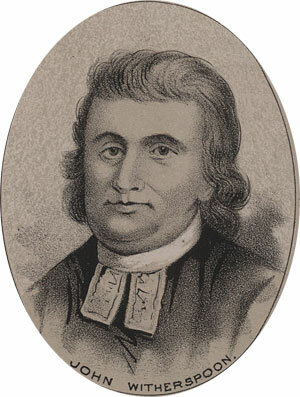 In colonial American, the best educated men were often found in the clergy. The College of New Jersey needed a first rate scholar to serve as its first president. Witherspoon was at first unable to accept the offer, due to his wife’s great fear of crossing the sea. She later had second thoughts, and a visit from the charming Dr. Rush secured the deal. He emigrated to New Jersey in 1768. Dr. Witherspoon enjoyed great success at the College of New Jersey. He turned it into a very successful institution, and was a very popular man as a result. He also wrote frequent essays on subjects of interest to the colonies. While he at first abstained from political concerns, he came to support the revolutionary cause, accepting appointment to the committees of correspondence and safety in early 1776. Later that year he was elected to the Continental Congress in time to vote for R. H. Lee’s Resolution for Independence. He voted in favor, and shortly after voted for the Declaration of Independence. He made a notable comment on that occasion; in reply to another member who argued that the country was not yet ripe for such a declaration, that in his opinion it “was not only ripe for the measure, but in danger of rotting for the want of it.” Witherspoon was a very active member of congress, serving on more than a hundred committees through his tenure and debating frequently on the floor. In November, 1776, he shut down and then evacuated the College of New Jersey at the approach of British forces. The British occupied the area and did much damage to the college, nearly destroyed it. Following the war, Witherspoon devoted his life to rebuilding the College. He also served twice in the state legislature. In the last years of life he suffered injuries, first to one eye then the other, becoming totally blind two years before his death. He died on his farm, “Tusculum,” just outside of Princeton in November of 1794, a man much honored and beloved by his adopted countrymen.